Images of Our Lady often relate to the culture in which they are found, they can also have political significance. The Shrine of Our Lady of Sheshan is close to the great city of Shanghai, a city which has known many significant changes. The Shrine dates from the 19th century when a Jesuit community bought land there and built a retreat house. The site, with wonderful views, soon became a place of pilgrimage and prayer. 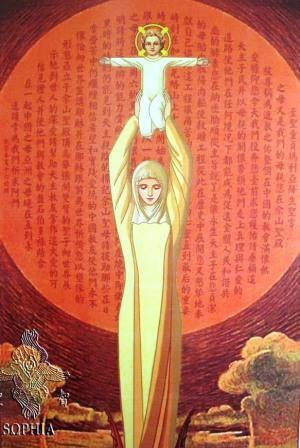 The image of Our Lady of Sheshan was originally based on western images of Mary but through the years a more distinctive form has developed in both popular Chinese devotional art and in the shrine itself. Mary is seen holding Jesus high above her head. The red and yellow colours used are notably different from the blues and whites of western art. Although the child Jesus holds out his arms in the form of the cross the image conveys serenity and joy. St John Chrysostom is the first person on record to have referred to Mary as ‘Help of Christians’ – a title particularly popular at the shrine at Sheshan. May 24th is the day dedicated to Mary, Help of Christians. It is a day of great celebration at Sheshan. It is a day too when Christians the world over are called to pray in solidarity with their Chinese sister and brother Christians. This entry was posted in Anglican, Anglo Catholic, Art, Catholic, Christian, Christianity, Faith, Mary, Pilgrimage, St John Chrysostom and tagged Sheshan. Bookmark the permalink.